Today , February 10th, is a really special day. 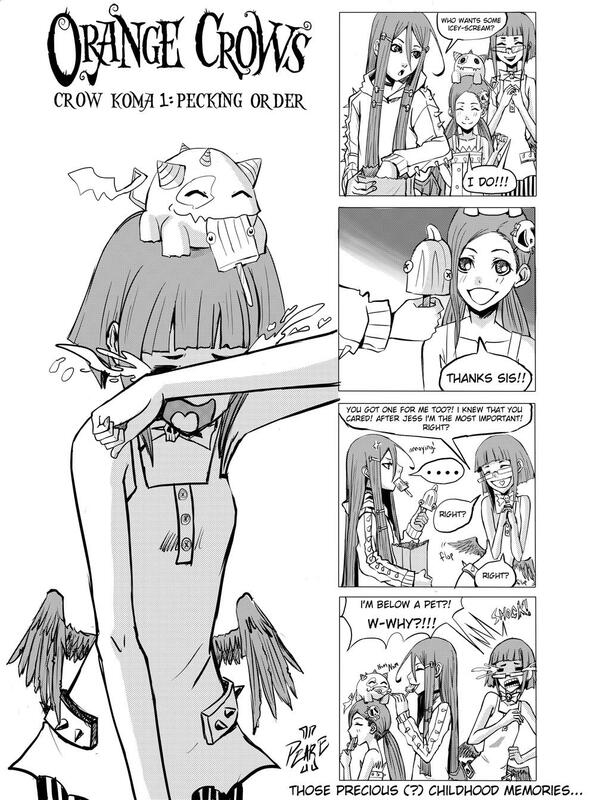 It is the anniversary of the release of the 1st volume of Orange Crows! Not only that, but the release of the book somehow happened to land on my birthday! I always thought that was a pretty fun fact. The series has been through a lot over the past 4 years. The first book came out with the intention of a 3 book release, but unfortunately due to circumstances at the time Tokyopop wasn't able to publish more. The book sat in limbo for a while, and during that time I worked long and hard to improve my art skills and plan for a future of both drawing and writing Orange Crows. There were times that I was disheartened and worried that I wouldn't be able to do it, but I kept pushing forward. Most of my free time was dedicated to brainstorming, writing, and art, and my precious videogame time decreased drastically! No time for games when there's work to be had! After talking to many wonderful people at conventions I realized that my efforts weren't in vain. Showing the first volume of the book created new fans, and even more important, revealed old fans who still remembered what Orange Crows was and wanted more. You all helped me gain the confidence to approach Stu Levy and ask him for the rights to continue Orange Crows. And I want to give a special thanks to you all, and especially to Stu for letting it be possible. I was now one step short. I had the will, I had the rights, but I did not have the money. That's when I decided to try Kickstarter on February 10th of 2012. Suddenly, even more people came out in support of Orange Crows. Friends, family, old fans, and new fans who discovered the story through Kickstarter....I was astounded by the amount of support that I recieved. It really touched my heart. So thank you to friends and fans (I also consider you all friends), and a special thanks to my Mom and Dad for supporting me and being confident in my skills. I am indebted to you all for taking the time to care about Orange Crows, and for helping my dream come true of delivering more to you. After volume 2 there will no longer be crazy multiple year gaps. Thanks to you all, the series will be able to thrive and continue at a more consistant pace. So, moving on to volume 2!Right now I'm continuing work on the enhancing of volume 2, and there will be more news on that in the very near future! While we wait, I thought I'd share something fun with you. As a special gift I wanted to give you all the first 'issue' of Crow Koma (Crow Panel), a 4 panel comic series that will follow the inbetween story adventures of the Orange Crows cast. What sort of antics did Natty and Cierra get into when they were younger? What was the group up to after Cierra returned to society and before the unfortunate tragedy at the end of volume 1? These short comics will reveal those answers to you! I hope that you enjoy the first one, and there will be more in the future. Thank you all again, and happy anniversary! !